We just returned from a wonderful trip to Sanibel Island in Florida. Like so many visitors to Sanibel our family got bitten by the "Shell Collecting" bug and we spent much of our time roaming the beautiful beaches hunting for shells. I am a big fan of using natural materials in decorating, especially shells, and one of my favorites items is the giant clam shell. When I returned home I looked through my files and found that over the years I had several images of the giant clam shell. I wanted to share with you a few of my favorites. The photo above is vignette from the John Derian's summer home on Cape Cod. 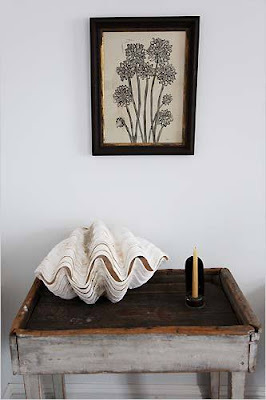 I love the unexpected texture the shell brings to this simple, rustic antique table. Perhaps the most obvious way to use a giant clam shell is on a table top. It lends itself well as a vessel for planting or housing a collection of fruit or decorative balls. I really love the example above. I find the contrast of the soft, willowy arrangement very striking against the rough coarseness of the exterior of the shell. Above is lovely living room of Ali Wentworth and George Stephanopoulos. You can see the giant clam shell in the fireplace. Here the shot is restyled and you can see a better view of the shell. I especially like the bold color of the back of the bookcases. It provides a wonderful contrast for the other shells which are displayed. These next two bathrooms are designed by Barry Dixon and they are fabulous of examples of using the giant clam shell in the bath. The glass shower creates almost a terrarium like display for the shell and provides a fabulous natural element. Barry Dixon again uses a giant clam shell and fills it with natural sea sponges. I love how the placement of the shell softens the lines of the tub. The chandelier and screen are also beautiful additions. I love to see the shells used in more unique ways like the sink above. I adore this!! Someday I hope to add a bathroom at the beach house with a giant clam shell as a sink. This particular one was beautifully executed. 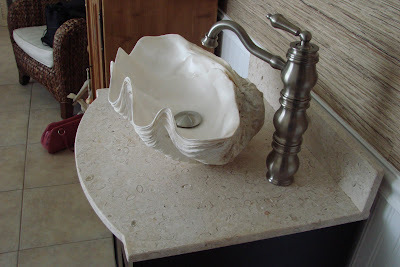 Here is a more opulent example of using a giant clam shell as a sink. 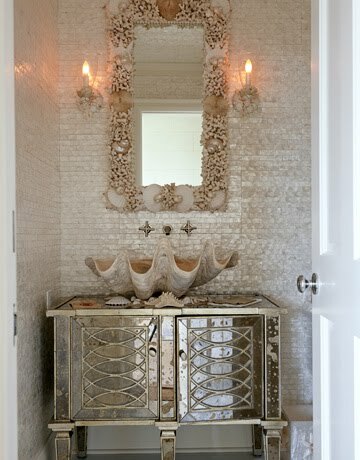 This bathroom, with it's mother of pearl tiles, is located in Southampton, NY. You can read more about this amazing home here. Finally here is wonderful vignette located on the back wall of the pool house of Antiquarian, Michael Trapp, via Joni at Cote de Texas. 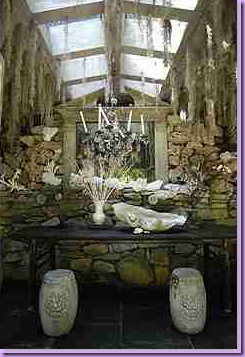 The giant shell adds a wonderful burst of white against the spectacular stone walls. This home is really extraordinary. You can read more about it here. Our Sanibel vacation inspired me add more shells to our beach home decor. We came home with a suitcase filled with our beautiful finds. I am anxious to get them sorted and displayed. More to come!! Hope you all are enjoying the summer!!! One day I will get to Sanibel .....one day. I have heard about it for years and was told that it was the last really good place for shelling. Is that true? I have a large clam shell filled with, guess....shells! How predictable. I am going to move my shells to another container and do something else with the big clam shell. Thanks for the inspiration! Beautiful! The first time I saw the giant clam shell was when we went to the Eastern Shore. We rented a recently built house decorated by a very talented woman! The centerpiece of the living room was a giant clam shell. It was on a coffee table made of some kind of natural material...almost like wicker but not at all...Thanks for sharing these. That sink is amazing. We LOVE Sanibel! My husband grew up in Fort Myers and we hope to buy a vacation home there, one day. Beautiful, beautiful! Giant clam shells are beautiful. They make beautiful centerpieces. In our last trip to south beach, I tried to look for one. I was told that they are very hard to find. Wanted one for my foyer table, filled with white orchids. Can't wait to see pictures of your finds. Thank you for sharing. and those sinks are beautiful... what a great idea! Beautiful pictures and I love the clam shells. I've never been to Sanibel but my husband says it's gorgeous! Have a fabulous weekend! Love the giant shells in the shower and by the bath. LOVE Sanibel Island! Have spent many happy hours picking up shell "jewels" - even had to buy a new suitcase once to bring home all of my treasures. This is a beautiful post, thanks for sharing,so glad to have discovered you! After growing up with shells everywhere, I got tired of them in decorating. But never in the appreciation of their beauty. I have to admit, you found some pictures that I totally love! And shells have been sneaking into the decor around here every so often now. I loved all of the pics. I have lots of glass floats and they would look great in one of those giant shells. Where did you find them? Glad you had fun! The clam shells as sinks are gorgeous. I would love to a bathroom with tumbled cobblestones on the walls, a rough piece of stone as a bench top and the clam shell on top with vintage taps...one day! Amazing shells I love the sinks...gorgeous! of life and times here...keep checking in for some more insights! Gorgeous and elegant! The shells add such serenity to these beautiful rooms. I love Florida, and have heard such great things about Sanibel island...sounds like you had a nice time! Really fabulous shells. A wonderful array of ways to use these beauties in decor. I love the one in the fireplace and as a table centerpiece. What a great gallery.. my faves are the planter on the dining table and the one in the shower. hope you are having a great weekend.. They are stunning used in the bathroom, it adds so much character! I love just walking the beach and looking for nautres creations, one of my favorite things! Welcome back! Thank you Gina for stopping by for a visit. Thank you for sharing all your beauty! mine is on my mantel. i actually have two - one large, one smaller. I am sending Kristin an email right this minute! small world! Love these photos. I recently did a blog post on how I used mine (nothing new and unusual) but would love to know what you think! P.W. Also love that horse in your header! Sanibel is gorgeous! I was there years ago but neglected to go shell hunting... I'm in a love/hate moment for the giant shells - love the look, but not so much the ubiquitous use of them. Great pics all, though. Hi Gina - Beautiful images and ideas! The shell sinks are fabulous. Sanibel Island is a wonderful place. I have boxes of shells that I brought home from Sanibel and from my parents in Naples, FL. That Barry Dixon bathroom has always been one of my favorites. I was up in Maine at antique stores this weekend and saw many giant clam shells for sale at various stores, but unfortunately they weren't selling for bargain prices. I adore giant shells as well, they are so decorative and makes any space extra interesting! Love this post! Great post! 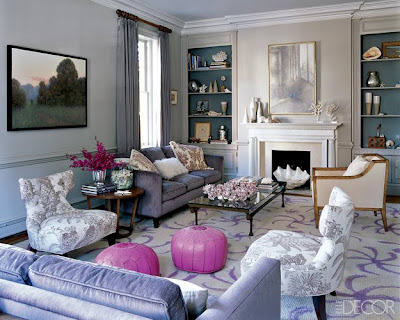 George and Ali's living room is one of my favorite interiors of all time! It served as such inspiration for my own home...and finding all these giant clam shells in each image was the most fun! Absolutely love the clamshell as a sink the very best! Gorgeous design concept. Nice post! The sink with the mother of pearl tiles is too pretty to use. I think the first really large shell I saw in a magazine was in Michael Trapp's CT home. I bought (stole;) a huge one, the size of the Barry Dixon shell in front of the tub. In Dallas, I kept it outside. When we moved the movers built it it's own huge crate, and they were warned that heads would roll if anything happened to it!! I love shells and coral and these are wonderful photos! I'm sure the list goes on and on about the things you can do with a giant clam shell. They are just beautiful. I love the sink idea! Totally unique and definitely a conversation piece! The 4th picture down was the inspiration photo for my now lavender guest room. HAHAHAHA pearls like Wilma Flintstones'? What creative ways to decorate with a HUGE clamshell. We live in a coastal community in NC and have never seen one so big! The shell sink is awesome! Found you through Kym at 3finegrains.. That clam shell is divine! Sanibel/ Captiva is such a special place to me. My husband and I took our first "vacation as a couple" there and now we try to get there at least once a year. I just love the clamshell sinks, posting those on my blog! Oh your blog is just lovely! Where could I buy a sea shell like this for my new house "nautical" bathroom sink?